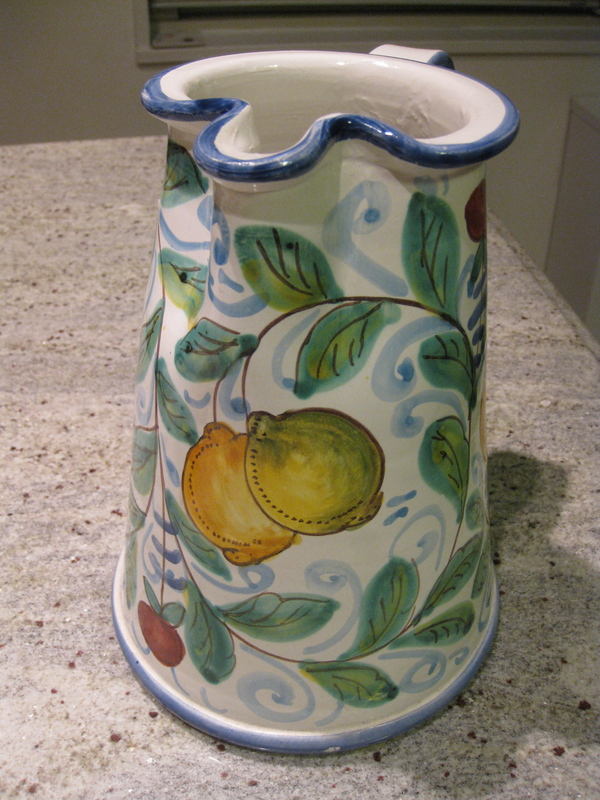 Black Friday, Small Business Saturday and Cyber Monday have put me in a shopping frame of mind, especially for unique and beautiful items, which brings me to the topic of Italian ceramics (“maiolica” in Italian), a great way to bring Italy into your home. Throughout Italy, you can find hand-crafted pottery and earthenware, made according to traditions and practices that are hundreds of years old. Since the pottery is often made with local clay, it means you will, literally, bring back home a piece of the place you’ve been. The sizes, types and styles of pottery seem limitless, depending on the region and tradition. 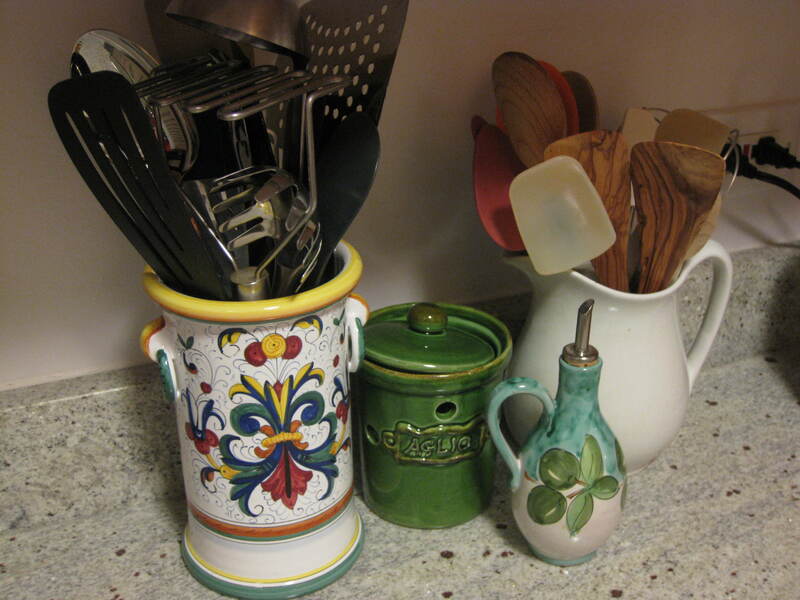 I’ve collected beautiful pieces of pottery from Deruta, Gubbio, Campania and Puglia. Depending on how much you are spending and the size of the pieces you are purchasing, most stores will ship your treasures to you back home, often for free. And, there is always room for negotiation. I procured this lamp in Ravello, on the Amalfi coast. I was with my friend Jill, who is notoriously cogitative when it comes to making purchases. I had no intention of buying anything, as I’d already made all my acquisitions for the trip. 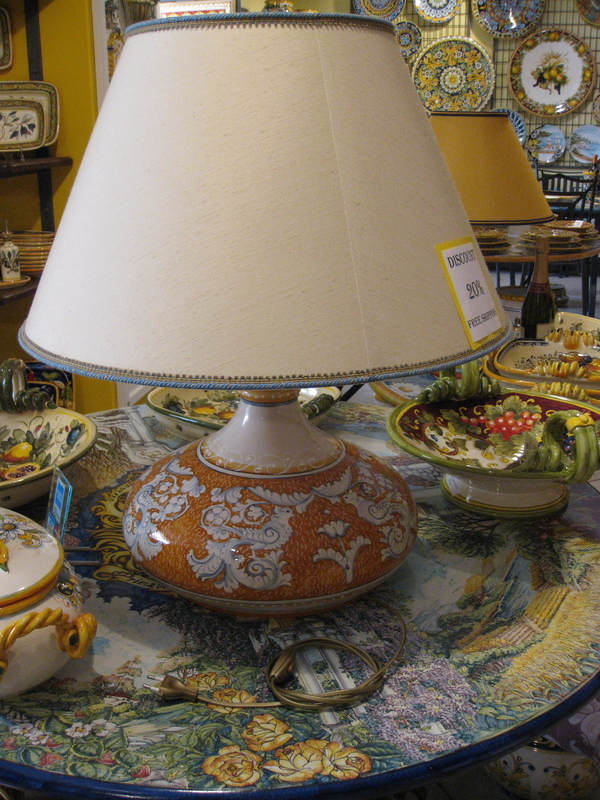 As I waited for Jill to decide between several ceramic pieces she liked, the lamp caught my eye. It was already on sale. As Jill’s deliberations wore on, and I continued to circle the lamp (repeatedly), I was offered an extra “sconto” and free shipping. How could I resist? It arrived perfectly intact, including the shade. Every time I turn it on, I’m reminded of my trip. And Jill continues to take credit for my find. Back in the U.S., I’ve struggled to find shops that carry the type and quality of ceramics I’ve seen in Italy, even in my hometown of New York City. Of course, a simple Google search uncovers plenty of online sources, but, for me, this is one thing I don’t want to buy on the interweb if I haven’t visited the source in person. Lucky for me, I have two great resources. One in an unexpected location, the other in the heart of San Francisco’s North Beach. When I lived in Kansas City, Missouri, my friend Jill (thanks, again, Jill!) turned me on to Mercato Italian Antiques. They deserve their own blog post because they have such cool stuff and their story is really interesting. For now, I’ll mention the great and unique pieces the owner, Mary Lies, finds and brings back to her showroom in DeSoto, Kansas (which is exactly what you’d picture a town in Kansas to look like). In addition to incredible antique furniture and decorative objects, Mercato always has unique and interesting ceramics, terracotta urns and pots, and a large selection of Buon Ricordo plates. I’ve found some terrific and unique Italian art and artifacts over the years in Mary’s great shop. Mercato also carries their own line of tableware. I love these distinctive pieces (Christmas gift idea?) and they are lead-free, so no worries there. One day last spring, while wandering through San Francisco’s North Beach neighborhood, I stumbled across Biordi Art Imports, on Columbus Avenue (insert Christopher Columbus joke here). 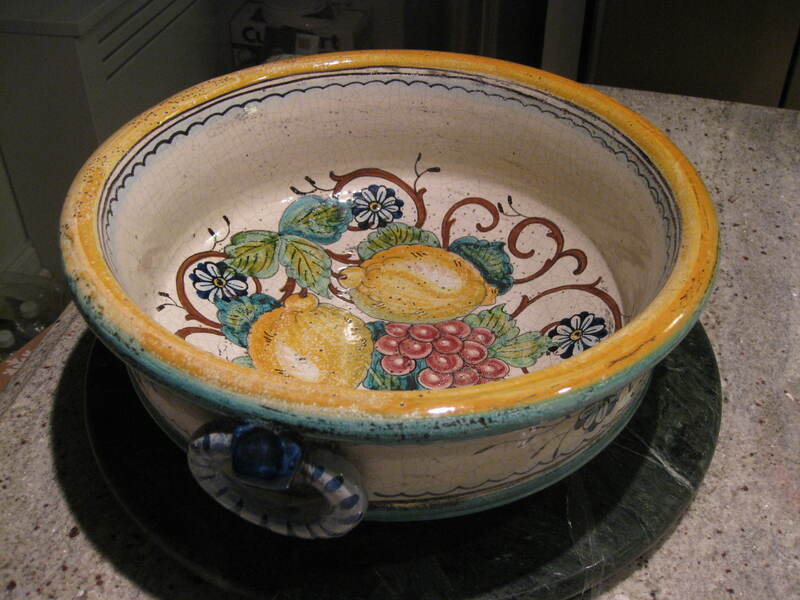 They carry a wide selection of top quality Maiolica, from stunning objects d’art to pieces for everyday use. I found a beautiful canister in a classic pattern from Deruta. 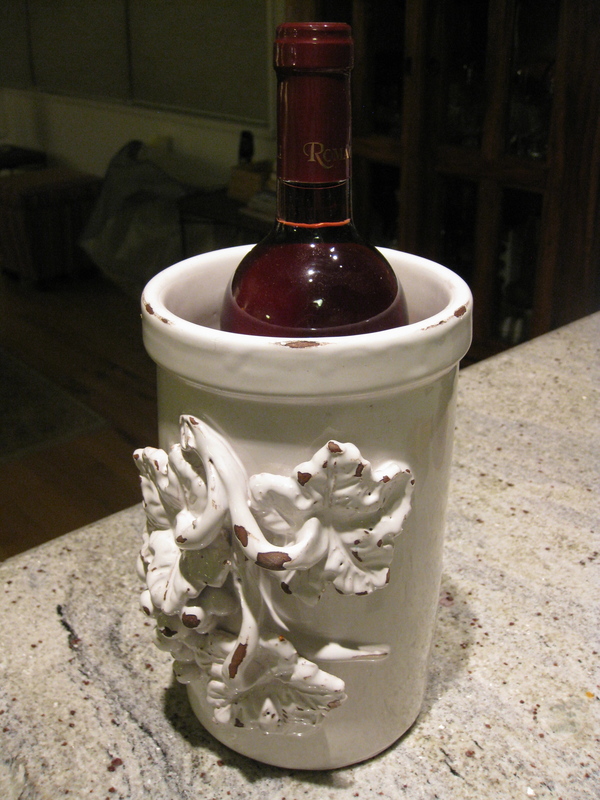 I use it to hold kitchen utensils and it definitely helps dress up my counter top. Biordi’s website features this video about how these ceramics are created. It is visually exquisite, revealing the beauty of not only the ceramics, but also the places where they are made. The craftsmanship that goes into each piece is impressive. As someone who has to concentrate when I address an envelope to make sure I don’t screw it up, the talent and skill these artisans demonstrate made me appreciate my Maiolica treasures even more. One of my favorite pieces, though, is one I never purchased. It is a beautiful bowl my grandmother brought back from Deruta on a trip she made to Europe after graduating from Syracuse University in 1919. Mamma mia! How cool is that?